Molyneux AX expansion adjustable rail clips have been used on crane runways to allow the rail to freely expand and contract. Traditionally, AX rail clips have been successfully used in hot climates where daily extremes in temperatures cause larger extremes in the expansion and contraction of the length of the crane rail. Because these are cam adjustable clips which offer excellent retention of crane rail pad beneath the rail, rail pad has been effectively installed in conjunction with AX rail clips. Installations of Molyneux AX crane rail clips include container crane rail runways in ports, overhead runways in steel mills and aluminum production facilities. Molyneux AX rail clips can be installed either by welded studs or by bolts passing up through the supporting steel. A variety of Molyneux AX crane rail clips are manufactured to meet various requirements. Common AX rail clips are illustrated within the attached web pages. 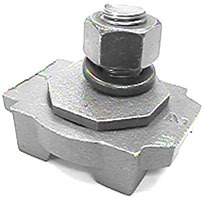 Not all of our extensive line of crane rail clips are included. Please consult Molyneux for additional products not featured within this web site.